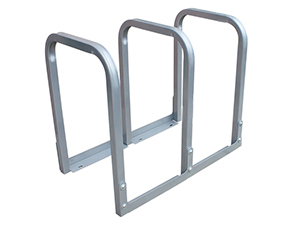 Upgrade the 'old-style', traditional school yard bike racks with U-Lockit™ bike racks. 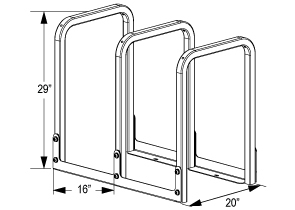 The compact U-Lockit™ features 3 inverted 'U' hoops bolted together on connecting rails, creating parking for up to 6 bicycles. Developed with convenience and efficiency in mind, the U-Lockit™ hoops is compatible with any type of bike lock and easily expands with add-on hoop arms. Ideal for urban spaces, schools or parks, the all-steel U-Lockit™ is an economic solution for reliable bike security.